Being charged with careless driving implies you're a licensed driver. That's not the case, however, if you're 10 in Colorado and crash through a place where you get a driver's license. 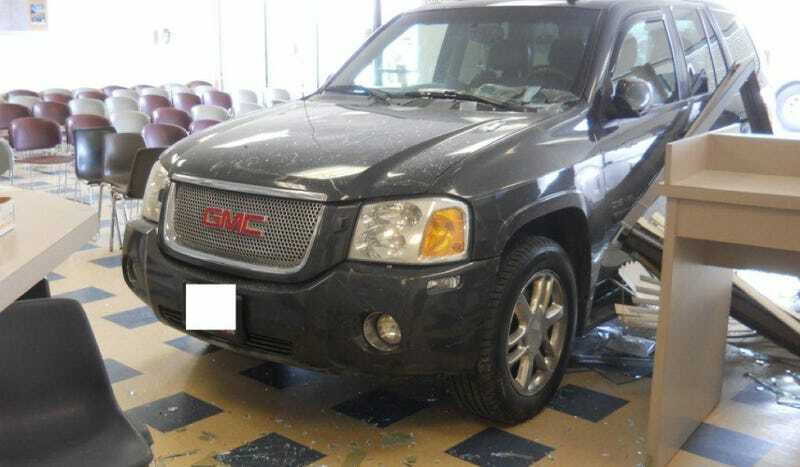 According to CBS Denver, a 10-year-old girl got into her mother's GMC Envoy that was parked across the lot from the window of the DMV in Parker, Colo. The SUV went just 20-30 feet, but still crashed through the windows of the office and went through the waiting area. Police said the girl's mother started to run alongside while her daughter was driving and was telling her how to apply the brakes. She still crashed through an office with about 12 people inside, although no injuries were reported. While the mother has not been charged with anything, her daughter was charged with careless driving. So maybe she'll think twice about carelessly getting behind the wheel before she gets a learner's permit.